The celebration of Kwanzaa is organized around the number 7. There are seven principles of Kwanzaa, each celebrated on a different day. The principles, in order, are unity, self-determination, collective work and responsibility, cooperative economics, purpose, creativity and faith. There are also seven symbols: fruits/nuts/vegetables, place mats, ears of corn, candles, candle holders, communal cups and gifts. 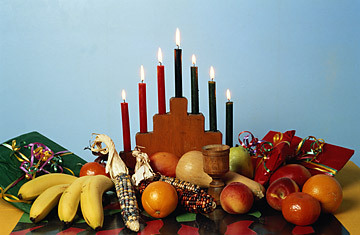 These seven symbols are arranged on a table at the beginning of Kwanzaa. On each day, members of celebrating households gather together to discuss the principles and perhaps read poems or perform music or dance.